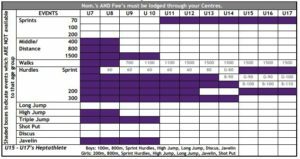 Regional Championships will be held on 9th & 10th February at Gympie Little Athletics Centre. Nominations are now open for all athletes U7 – U17. Athletes may compete in up to 5 events across the 2 days. Please refer to the attached draft program and parent information doc for all you need to know. Nominations will close Friday 25th January so jump in and nominate today! With some heavier rainbands heading our way and the condition of the infield very soggy, tonight’s meet is CANCELLED. Fingers crossed for clear skies next Friday. It’s almost time for our End of Season Celebration at Aussie World which will be held on Friday 16th March. The event will open at 5.00pm with the Presentation to commence at 5.30pm sharp. All athletes MUST wear their Uniform shirt for entry to the presentation. All athletes will receive their season 17/18 participation medal when they arrive at the event. Athletes are to sit with their parents in the seating provided. A very short general meeting will be conducted (10 mins max I promise!) followed by the presentation of trophies. All athletes and parents are to remain in The Shed during the presentation doing what we do best – encouraging and supporting all our athletes! At the conclusion of the presentation the park will be open for 2 hours for rides and fun (6.30pm – 8.30pm). Food will be available for purchase from the Aussie World food venues. RSVP NOW so you don’t miss out! All you need to know about 2018 Regional Championships. Please check nominations. Please note there have been changes to the program. Revised program is attached and team list highlights in YELLOW events where time has been moved back and in BLUE where events have been moved forward. Please check the program carefully. 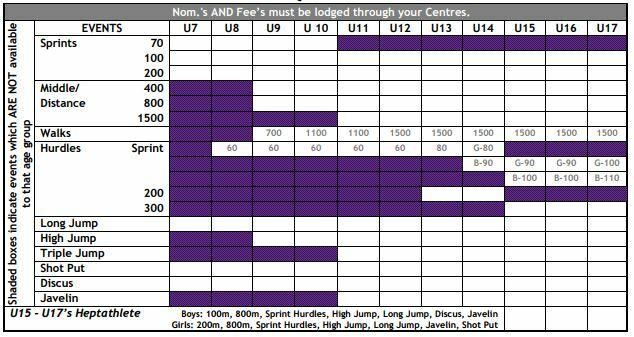 Regional Championships will be held on Fri 9th / Sat 10th / Sun 11th Feb at Noosa Little Athletics Centre for all athletes aged U7-U17. Regional Championships is a fantastic event and we would love to field another strong UNI team this year. Please see below for all you need to know including the available events for each age group. Sound like fun…….nominate now!! We’d love to have you as part of the UNI team. Nominations will close Wednesday 24th January. Nominations for Regional Relays are now open! Regional Relays are coming up on Saturday 11th November 2017 and nominations are now open for all athletes in the U7 to U17 age groups. Regional Relays is always a fantastic event as it gives our athletes the opportunity to compete as part of a team. And to make it even more exciting this season we are hosting the event at our track! If you are unsure what the relays is all about, please read the below document which explains how the relays work. If you are interested in nominating for Regional Relays, please ensure that you have read and understood our Regional & State Relays selection policy. A copy of the DRAFT program, the events offered in each age group and an information document for parents and athletes are attached (Please note that the program at this stage is draft only and subject to change). So join in the fun and nominate now! Nominations will close on Friday 20th October 2017. Registrations for our 17/18 season are now open! Our registration system provider has upgraded their software and there have been some changes. Please see the attached guide to help you through the registration process. It’s going to be a great season so jump on in and register now! 17/18 season registrations are now open! It’s warming up and that can only mean one thing……athletics season is almost here! Registrations for the 17/18 season are now open. So complete your online registration now! Or come and see us at one of our Sign On Days on Saturday 19th & Sunday 27th August from 9am – 12pm. As part of this season’s registration process we are asking parents to choose an area in which they are interested in volunteering. We cannot run successful competitions without our fabulous parent volunteers and this will help us to identify any areas where we may need some further assistance. Of course if you are interested in taking a more active volunteering role we would love to hear from you. You would be joining an amazing team and your kids will love you for it! Drop us a line at [email protected] if you would like to know more or come and have a chat to us at one of our sign on days. It’s going to be a fantastic season and we can’t wait to welcome all of our new members and returning USCLAC family.